Forced to go to school on Christmas Day; no entry into the church for children under 18. Now even traditional New Year poems forbidden if they have a religious references. 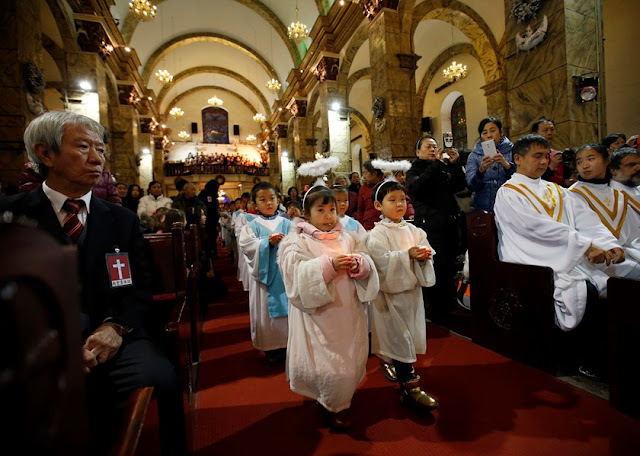 Shanghai (AsiaNews) - Children under 18 were stopped at the entrance to churches to enforce a ban on not having them participate in the Christmas Mass; in schools, students were ordered not to celebrate the Christian festival in any way and forced to attend lessons. Even the couplets (traditional greeting cards for the Chinese New Year, to be put on the side of the doors of the house, which Christians adapt with religious thoughts) have been forbidden. The testimony of Fr. Stanislaus, a priest from northeastern China. His story tells of the resistance of the young, who pressed to enter the church. Only the intervention of the parish priest has calmed the waters. The day before yesterday, the morning before Christmas, the officials of the United Front and the Religious Affairs Bureau came to give their best wishes. They warned of security problems and then reminded me that minors were forbidden to attend Mass or evening meetings, even during the Christmas season. In addition, the Spring Festival greeting cards cannot be sold or posted before they have been approved. I replied: on many problems we need to continue discussing; many opinions can only be opinions, not norms, and could not be as general as constitutional policies. The leaders of the United Front perhaps did not intend to argue; open the topic, they were quick to leave. However, before Christmas, the Department of Education informed each school, either verbally or in writing, that the classes had to be continued during the day and in the evening. Orders were also given for students not give gifts or organize religious parties or meetings during Christmas. Fortunately trusting in God's grace, our children, one after the other, came to Midnight Mass. The police men eventually held out by being on guard only for public security, without interfering with the affairs of others. Early in the morning I received a call from my mother: she spoke excitedly. She told me that at the church in our village government officials had strictly forbidden minors to attend the functions sparking a heated argument. In the end, in order to proceed with the function the parish priest blessed the children, leaving them to return home. The next day I learned that the same thing happened in another church in the area: children were not allowed to participate. Government officials were present watching from beginning to end. At the church in my city, the Religious Affairs Bureau sent people to watch, so the minors were in other clubs and did not attend midnight Mass. In another church of a large city in my province minors were not allowed to participate. Security systems were placed at the gate and at the door, on the one hand to check, on the other to send people back. In the news we heard the spokesperson of the Ministry of Foreign Affairs, Mrs. Wah, full of rhetoric and self-assured saying to the world: "You do not understand China. Do not you know how many Buddhist and Taoist temples and Christian churches operate legally in China? According to the law, Chinese citizens enjoy full religious freedom! We have taken preventive measures against terrorists and extremists, to allow so many ordinary people to fully enjoy normal religious freedom! "The news continues to speak of" confidence in one's own culture" and "religious freedom". In the country churches of my area the crosses were removed and then put back; but maybe in the future they will be destroyed. What is of note is that these are registered places of worship. The Church of my province did not even have permission to print the couplets for the Spring Festival. The Church's couplets have been destroyed in the typography’s warehouse. (I personally wrote them, holding the brush and dipping it in ink). Hopefully next Christmas we as people of God can bring all people to Gods Garden of Love all three Abrahaic Religions The Jewish, Christians and Muslims " one heart, soul at a time"